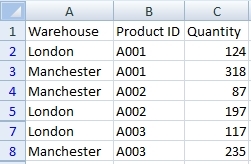 This example shows how to remove duplicate rows from a table. In the following table you can see two duplicate rows. It’s row number 2, 9, 10 and 3, 6. 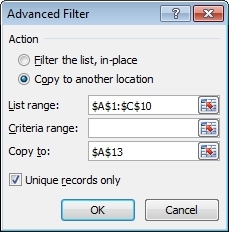 Select the table and go to the Advanced Filter menu. You find it on Data -> Filter -> Advanced (Excel 2003 and higher). 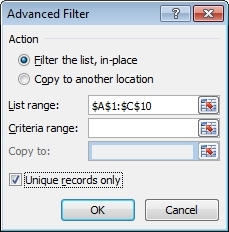 Check Unique records only and press OK.
Advanced filter hide duplicate rows (6, 9, 10). 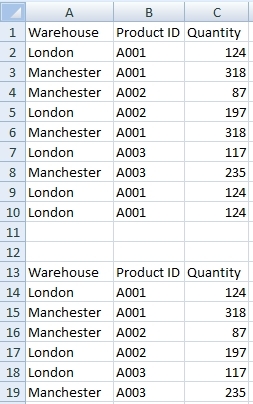 If you want to keep the original table, choose Copy to another location and in the field Copy to write the address of the cell where to place a new table. 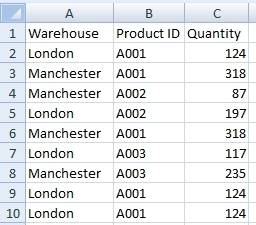 Note: In the Excel 2007 and lower must be a new table on the same sheet as the source table.